When it comes to air sampling equipment, the slit-to-agar design is something of an industry standard. Regulatory guidance limits for air viables were actually based on recovery of microbial contaminants with slit-to-agar air samplers. It has existed for years and in that time has performed admirably, delivering incredibly accurate results in a wide variety of circumstances. At EMTEK Air, we believe that embracing existing technology is critical in moving the industry forward. That’s why EMTEK’s Patented R2S microbial air sampler incorporates the industry standard slit-to-agar sampling methodology you’ve come to expect, along with a few notable improvements. 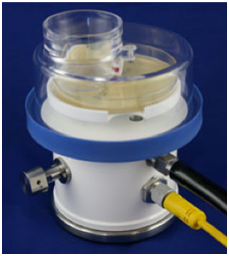 The R2S air sampler provides optimal organismal recovery, as reflected in ISO 14698-1 driven validation testing performed. It simplifies the enumeration of recovered organisms and allows you to easily calculate the number of organisms per volume of air. Additionally, it offers up to 120 minutes of continuous, active monitoring per sample cycle. In short, the R2S is designed to provide you with the maximum amount of accuracy possible while simplifying some of the more complex and tedious elements of the air sampling process. We’ve designed the R2S air sampler in a way that enhances its ability to collect samples. It’s only 5.5 inches tall and 5 inches in diameter, which means you can deploy it in almost any environment and it has a small cross-sectional area that minimizes laminar airflow disruption. The unit itself generates virtually no particulate matter, as well as samples and recovers bacteria at the point of operations. We’ve also built the device to ensure you can quickly and completely sanitize all exposed surfaces as needed – cross-contamination risks are minimal due to this design. Additionally, the R2S as operated with our V100 Controller can operate up to 90 feet away from the controller and will filter and exhaust the sampled air volume at the controller unit outside of the critical environment. It is an ideal solution for Class 100, ISO 5, or Class A/B LAF hoods, isolators, fill lines, and BSC, as well as bulk production and support areas. Our role at EMTEK Air is building the best and most cutting-edge air samplers on the market, and the R2S delivers flexibility, accuracy, and efficiency you can’t find anywhere else. For more information about our products, visit www.emtekair.com or contact us at 877.850.4244 with any questions.